Underworld influence backing DAP politicians is an open secret. Behind any loud or rumbunctious DAP parliamentarian or state assemblymen, Chinese or Indians, there is the likelihood of them being gang leader or backed by underworld. To the underworld, they judge Maria Chin as traitor for supporting Ramli Md Noor. That dark world has only one way to deal with traitors. If it is not the person, the unguarded children could face retribution. The more laughable allegation from BERSIH would be the one UMNO and PAS are involved in racist campaigning. That could be easily debunked. 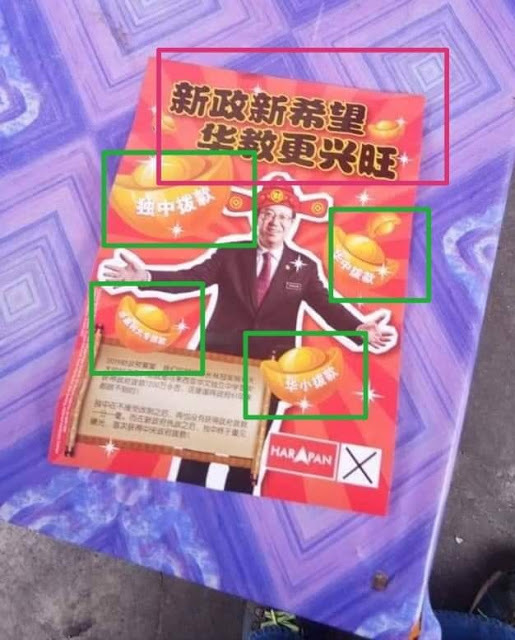 How would BERSIH explain for this Chinese written pamphlet distributed to the Tanah Rata Chinese? Blogger Cucu Tok Selampir raised issue with the Chinese written pamhplet meant for Chinese voters in which many many promises were made on Chinese education. For that matter, why was DAP playing up the death of Teoh Beng Hock for a long time if not to stir up racial sentiment? 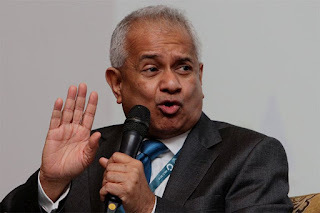 One can see DAP's silence on the death of Adib and even defended Waythamoorthy. Simply, it is because of racial political interest. If it happenned to a non-Malay, they would be up in arms with the Inquest. Then, why did BERSIH raised the issue of racial campaigning and DAP suddenly became sympathetic of UMNO to remind them of the danger of PAS? 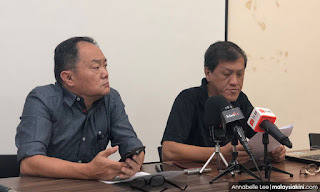 BERSIH's accusation is to prepare the ground for their future political propaganda in the light of potential strength of UMNO-PAS to draw Malay support. 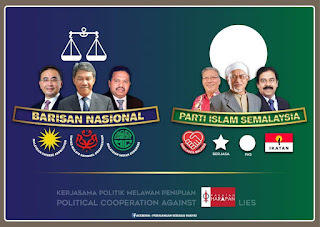 UMNO and PAS lost many seats during GE14 because each were splitting the others on the Malay Muslim seats in Semenanjung. According to Asyraff Wajidi, an UMNO-PAS coalition could turn 29 PH-held Parliamentary seats at the next GE15 election, at least on the Semenanjung side. The racial composition at the next Waterloo for PH and PPBM at Semenyih by-election may not be so favourable to PH. PPBM won the seat during GE 14 with 23,428 votes. While, BN and PAS received 14,464 and 6,966 votes, respectively. PSM received 1,293. It would certainly be a tight race for this PKR and Azmin faction stronghold. With majority public disappointed with the disastrous fiscal management by Lim Guan Eng, few thousand votes could swing. If PPBM wants to win, they could consider putting up a PPBM staunch supporter, Dato Siti Nurhaliza, as suggested by one blogger. Put action to her pretty mouth. Another "exemplary" candidate for Semenyih should be VP Tan Sri Abdul Rashid Abdul Rahman. He is synonymous with Semenyih. 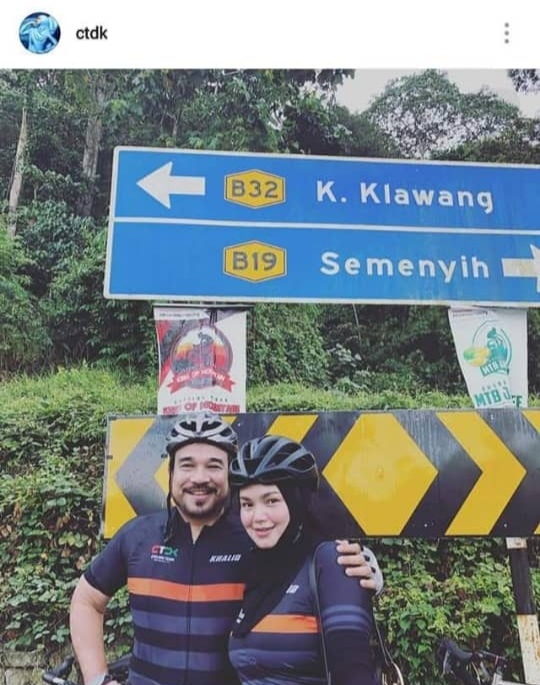 as he owns large tracts of land worth millions in Semenyih. To the point, a village road is named after him. Much as Tun Dr Mahathir expressed confidence to win Semenyih, he may not risk any of his party heavyweight and put up a macai status candidate. BossKu, or more appropriate KelingKu, realised he is sliding in popularity. 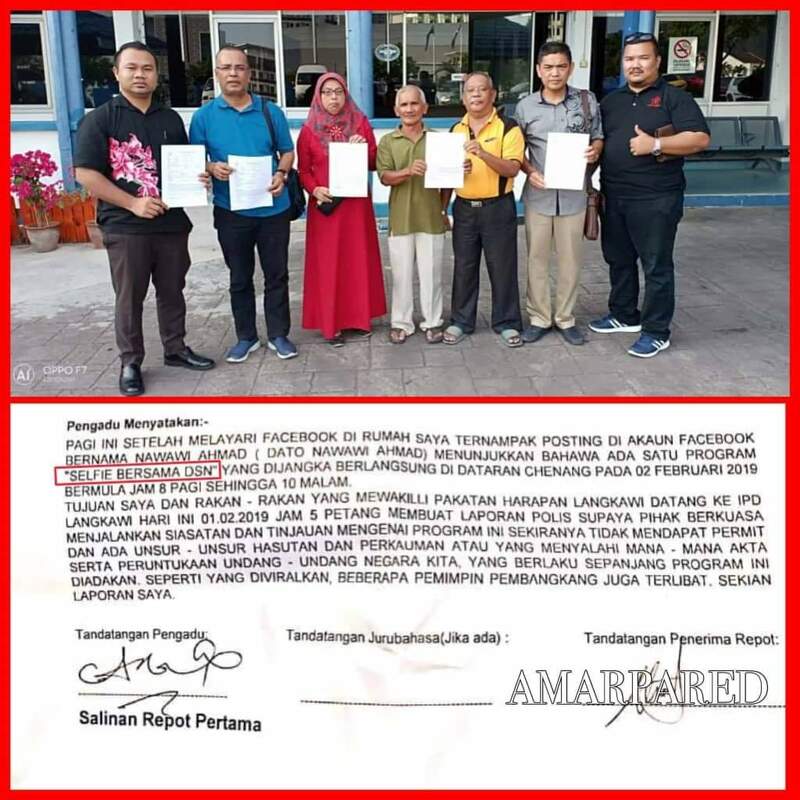 He felt threatened by Najib that he got his boy - a PPBM member on Langkawi Council, to make police report against Najib's visit. Ambiga has warned PH on the threat of Najib's walkabout. Dato Abdul Kadir Jasin and Tun Daim gave a red alert warning that PH stand to lose in the next GE15. Mahathir realised the risk voters will punish PH for their poor performance on the economy. However, he chose the political narrative to call UMNO-PAS coalition as cheating or meant as racial bullying. Are there not non-Malay working with UMNO and PAS? Astute observers agree there were cheating or electoral offenses at Cameron Highland, but they would not agree to the accusation BN committed 14 out of the 23 offenses alleged by BERSIH. Reading purely from pro-BN blogs, and social media covering the by-election, the list of proven offenses by DAP and federal government agencies exceeded 15. 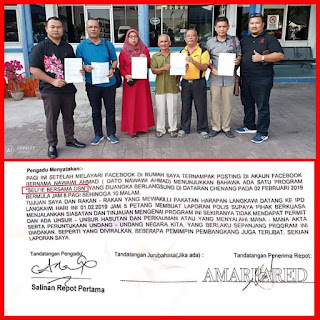 Pemuda UMNO Chief, Dato' Dr Asyraff Wajidi himself could mentioned some 12 electoral offenses by DAP campagners in his Facebook HERE. If BERSIH are afraid, then spend money to hire bodyguards for Maria Chin, Ambiga, Thomas Fann and the vocal and rumbunctious ones among BERSIH activists. Quite sure, the Israel-backing US are willing to foot the bill for them. If not, submit themselves to DAP-linked underworld and gangsters. There is also the possibility BERSIH statement was a diversion to save face Attorney General, Tommy Thomas. He put together a Tribunal to do an internal investigation on former members of EC. BERSIH defended Tommy's narrative to seek punishment on former EC members for alleged electoral offenses. Unfortunately, it is not working either for BERSIH. Tommy was made a fool by his fellow Bar Council activists. He is accused as being unethical. His comments is disrespectful of ex-EC members. And, there is a call on him to resign in the light of lawsuits from the six affected EC former members. Next time, do not expect people to do extensive "academic" legal work on internal enquiry for political mileage but on pro bono basis. 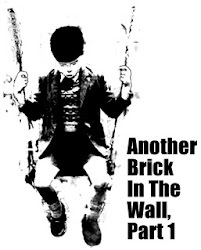 You pay peanuts you get monkey. You insist on free work, you get monkeyed. Peruvalen was force to do it for free!